Lately, I’ve been following some of the tips from the book Goodbye Things: On Minimalist Living, by Fumio Sasaki. This week, I decided to try Tip 31, which is: Think of stores as your personal warehouses. This tip is a useful reminder for me, because I have a habit of buying for now, and for the year(s) ahead. As one part of my habit shift for the next 6 months, I am going to make better use of the items that I have and cut down on buying additional products until I absolutely need them. As I mentioned before, I tend to accumulate a lot of products and then forget about them. This season, I’ve corralled everything into one drawer. I take a photo every time I take out a new product, and save it on my phone. If I’m out shopping and want to buy something, I refer back to the photo and check to make sure I don’t have something similar already. I’m happy to report back that so far this method seems to be working, and I’ve really cut back on impulse purchases! Also as part of this new habit shift, I decided that I would save the empty bottles and packaging for a year, so I can make a more well-informed assessment of how long it takes me to use up particular products. I use washi tape and a permanent marker for my date labels. 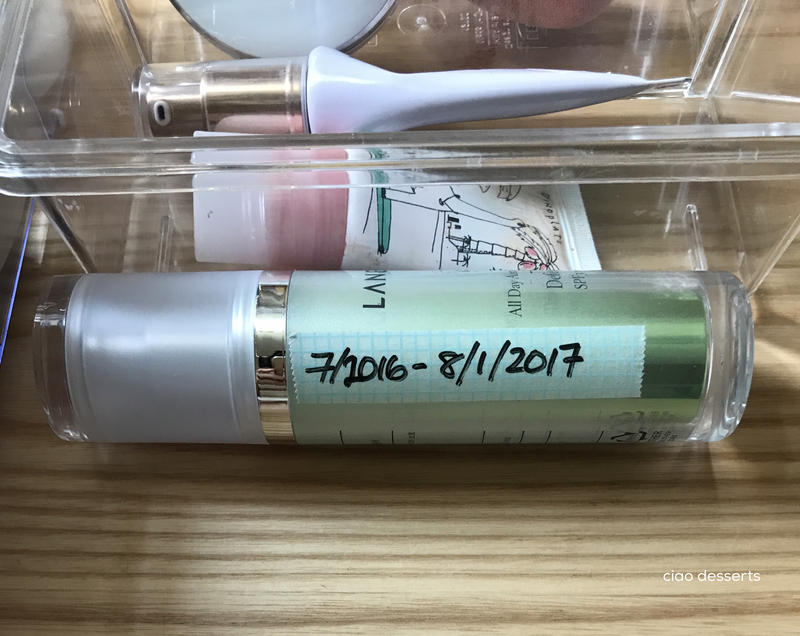 Now, whenever I get a new product, I attach the washi tape label with the start date right after I remove the outer packaging. Using washi tape as labels works quite well because the tape is waterproof and so the labels survive daily manhandling and being dropped into the sink. Based on my empties, here are some of my observations so far: I’m surprised by how quickly items like facial cleansing puffs get used up ~ I have to replenish my supply almost monthly. With daily use, my liquid foundation lasts for about 5 months. Surprisingly, I don’t use face masks as often as I thought. I use maybe one every 2-3 weeks. But, I buy them all the time. Consequently, I have currently have a massive supply of them that will probably take me the next 6 months or so to use up. Now that I have a clear idea of what products I currently have and the ones that I will need to replace soon, I can rationally plan what to buy, how much to buy, and when to buy. The department store anniversary sales in Taiwan are in full swing; in the past, I tend to go a little overboard, either overestimating the products that I will need for the next 6 months to a year, or buying impulsively to meet a certain amount for a free gift. The consequences of those actions is that I end up storing extra products in my limited space, when that space (and money!) could be put into much better use. 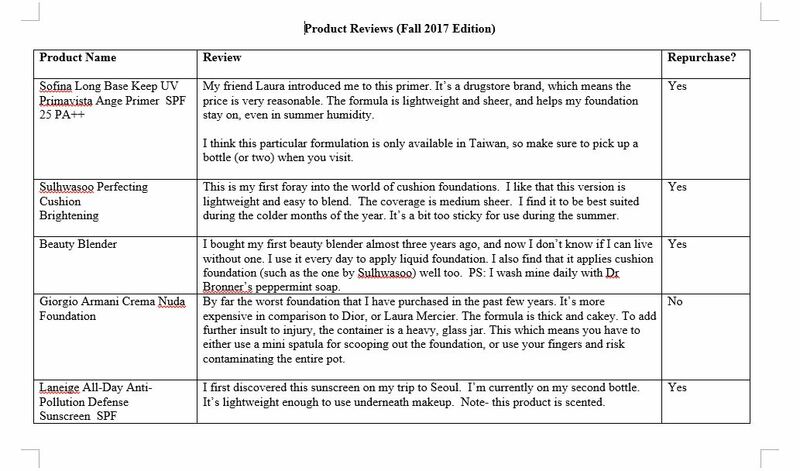 But this time, I know that I need just 2 bottles of foundation to get me through until the next round of sales (in May). I also don’t need any serums or eye creams because I still have one of each from my previous trip to Korea. 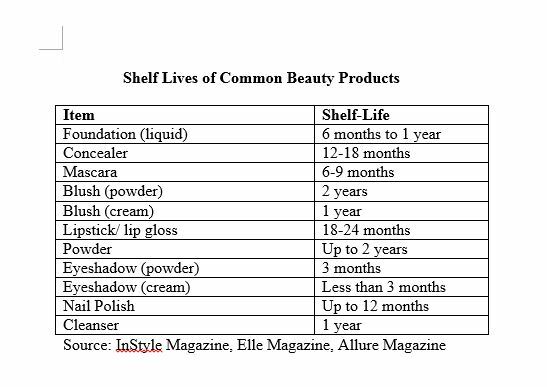 I might treat myself to one new lipstick and eye shadow, because the ones I have will either be nearly used up, or close to their expiration dates. P.S. : I’ve also included some quick thoughts on some of the products that I’ve finished using so far. This was not a sponsored post. I paid for all items with my own money, and opinions expressed are based on my experiences.